People. Am I the only one who removes that super-annoying tag from new pillows before using them? You know, the one that has laundering information on it? And is it strange that when I find a pillow I like, I use it for, say, 5 years or more? I'm not sure what the lifespan of a pillow is supposed to be, but I'll tell ya I keep inadvertently shortening said lifespan. Keep reading. Monday night there was a HUGE spider in our living room. That night I felt like I had creepy crawlies all over me while I tried to sleep. Tuesday I spent the day washing sheets, vacuuming the mattress and box spring, spraying anti-dust mite ((eeew.) spray, vacuuming more, vacuuming under the bed, dusting the bedroom furniture, spraying some Febreeze everywhere, etc. In addition, I realized the pillows hubs and I currently use are from WAY before marriage... in other words, about 5 years old. I'm thinking, how many nasty germs have been living up in those pillows for the past 5 years?! Gag. So it was time to clean them. Note: I'd removed the little tags from these pillows approximately 5 years ago. I guess I should also disclose here that I had a pillow once that I wanted to clean. 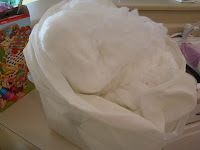 I put it in the washing machine (gently cycle) but by the end of it, it looked like winter had arrived in my washing machine--stuffing everywhere! Oh, well. I figured it was probably just that pillow being old and not able to handle a good washing. Back to Tuesday. 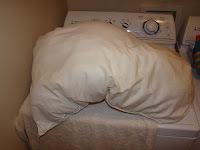 I put both mine and hubs' pillows in the washing machine, gentle cycle, with an extra rinse. This time I bothered to check on them often throughout the cycle. Good thinking, eh? Well, I checked once during the initial washing phase and found both pillows appearing to be fully in tact. Until I tried to flip mine over so the top of it would get nice and clean, too. Apparently the bottom seam had done ripped open and stuffing was ready to go Every. Where. Ya, just what I was afraid of. So the washing machine was completely full of water at this time. It took some effort but I removed my pillow and set it aside, checked on hubs' pillow (which amazingly was just fine) and let the washer keep doing it's thing. As you can imagine, it's time for me to do some pillow shopping. Of course my first instinct is to go to Bed, Bath & Beyond simply because I keep getting those 20% off any item coupons in the mail. Plus I could test the pillows out a bit and make an informed decision. But then I think of the pillow my sister-in-law received for Christmas from Pacific Coast Feather Co. I checked those out online and they seem like super pillows, but I'm a bit wary of purchasing one online without trying it out first. Of course they have a 30-night guarantee so if you don't like it, you can return it within 30 days, but I'd still incur the shipping costs (both initially and for the return), so that's an extra $10 bucks or so. I just hate paying for shipping--especially twice! So, I'm probably gonna head over to the local BB&B just to check out their selection and see if there's a pillow there that I completely fall in love with. If not, I'll be shopping online (as I do for pretty much everything else anyway!). Oh, before I forget... So hubs' pillow made it through the wash, right? Well, it went into the dryer and literally went through at least 6 dryer cycles totaling about 5 hours of drying time. And the end result? Ya, the picture doesn't do it justice. We're talking clumpy lump city there! Um, hubs is gonna need a new pillow, too.